Emma & Shannon celebrated their marriage with a spring wedding at Forest Hill Winery in Denmark WA. Emma and the girls made their preparations in one of the chalets at Celestine retreat. With the high views of the Southern Ocean and fantastic natural lighting, it’s a wonderful venue for preparation photography. Denmark being the beautiful place it is, we didn’t need to go far for some stunning location photos. At sunset everyone gathered for the reception at Pepper & Salt Restaurant. Clayton & Rhian’s Albany Wedding began with preparations for their ceremony at St John the Evangelist Anglican Church in Albany WA. Locations included Ellen Cove at Middleton Beach where the sunset was wonderful! Our final location was the Albany Entertainment Centre, where the couple held their reception. 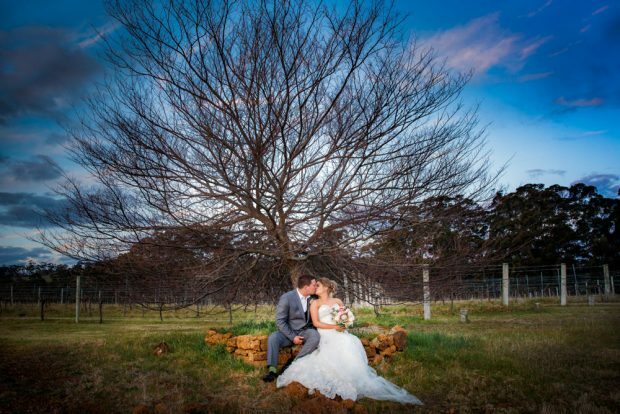 Photographica offers professional wedding photography services throughout Denmark, Albany and Great Southern WA. Let Kirsten capture the joy, emotion and beauty of your wedding day! David & Jennifer’s Lake House wedding began in Albany where the couple prepared together in their lovely Albany home. The ceremony was to set to place at the Lake House in Denmark where they looked forward to sharing their vows with a small gathering of their family and friends. With the day set to transition from Albany to Denmark, they wanted to make the most of the wonderful variety of locations on offer and so we started the day with a location shoot! The couple picked their favourite spots and the day unfolded beautifully. The ceremony was held under a lovely willow tree at The Lake House in Denmark WA and was followed by an early afternoon reception on the Lake House’ deck in the glorious sunshine. I love intimate weddings and these two really did it in style! We are so happy that we chose Kirsten to be our wedding photographer. The photos turned out so beautiful – everything we hoped for and more. Our wedding album is amazing, from the photos, to the close ups, to the black & white pics and the added touch of having our favourite photo on the front cover was lovely. The background colours chosen by Kirsten really complement the album. We were involved in the process of choosing our favourite photos and we were able to give feedback on how they would appear in our album. Kirsten has a very relaxed nature and this helped to ease our nerves on our ‘big day’. Posted in Albany WA Wedding Photographer, Denmark WA Wedding Photographer, Wedding Photography by Photographica and tagged Albany Wedding Photographer, Denmark WA Wedding Photographer, The Lake House on March 11, 2014 by kjwp3.